Receiving the AcSEED Award for St Philip's School are (from l to r): Debbie Battle (Safeguarding and Prevention officer, and Wellbeing Emotional Support Team Lead), Ben Walsh (Head teacher). Congratulations to St Philip's School in Chessington, Surrey, who have been accredited with The AcSEED Award. The AcSEED assessment team were impressed by the comprehensive wellbeing support provided by St Philip’s School, by the wide range of mental health and wellbeing information and training available, and by their tailoring of wellbeing provisions and services to meet the specific needs of their pupils. Debbie Battle, Wellbeing Emotional Support Team (WEST) lead at St Philip's School said "We will continue to do everything we can to support our young people through any emotional difficulties they may encounter". Read the school announcement here. Congratulations to The Sixth Form College Farnborough in Hampshire, who have been accredited with The AcSEED Award. At a ceremony to mark the achievement on Thursday 7th July 2016 the award was presented by AcSEED Chief Executive Nick Gatherer to college Principal Simon Jarvis and Deputy Principal for Student Services Catherine Cole. Also attending from the College were Lead Counsellor Claire Basil, Health and Wellbeing Co-ordinator Kirsten Halvorsen, and members of the college's Health and Wellbeing team. Congratulations to The Beacon PRU in Redditch, Worcestershire, who have been accredited with The AcSEED award. Congratulations to Lordswood Girls' School in Harborne, Birmingham, who have been accredited with The AcSEED award. Congratulations to Cedars Upper School in Leighton Buzzard, Bedfordshire, who have been accredited with The AcSEED award. 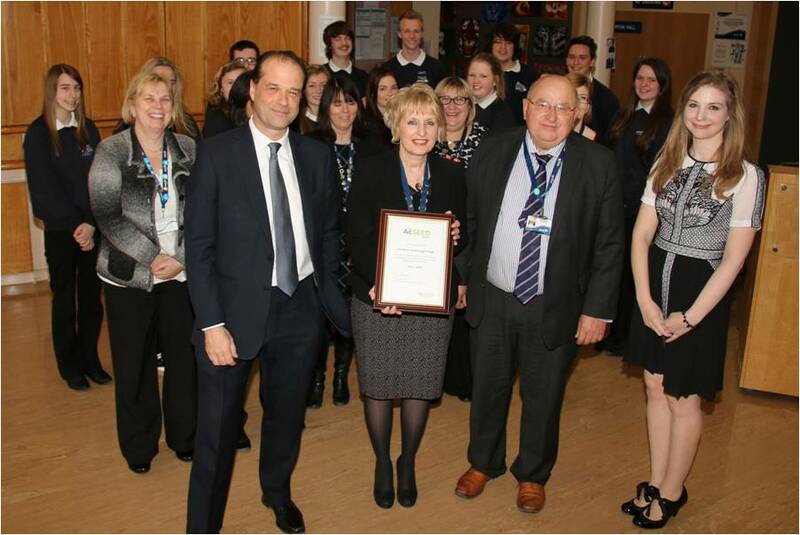 Congratulations to Trinity School and College in Rochester, Kent, who were presented with The AcSEED Award at a ceremony on Friday 27th November 2015. Headteacher Elizabeth Baines received the award from AcSEED principal assessor Helen Galsworthy. Also attending were representatives of the wellbeing staff at Trinity, and the Mayor of Medway Cllr Barry Kemp. 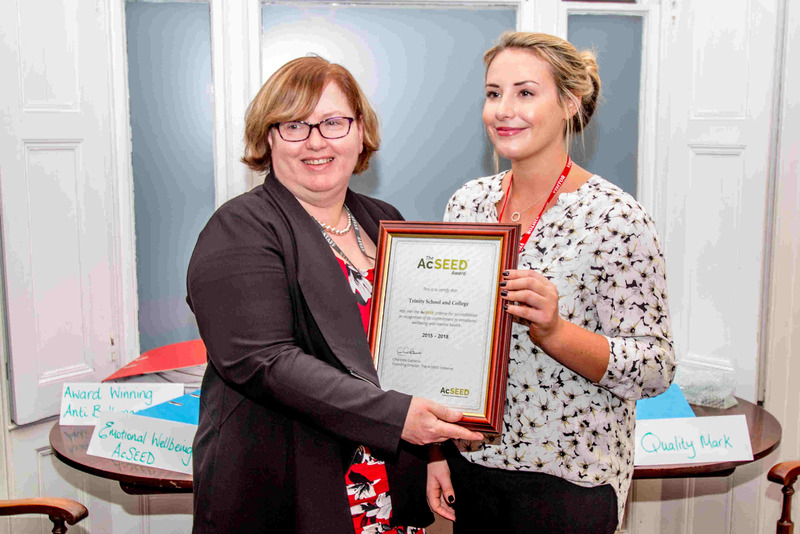 Congratulations to Applemore Technology College in Hampshire who were presented with The AcSEED Award at a ceremony on Monday 6th July 2015. Headteacher Mr Roland Marsh received the award from AcSEED founder Charlotte Gatherer, and paid tribute to Mrs Heidi Kavanagh and other student support staff, and to the young people who act as Peer Mentors within the college. 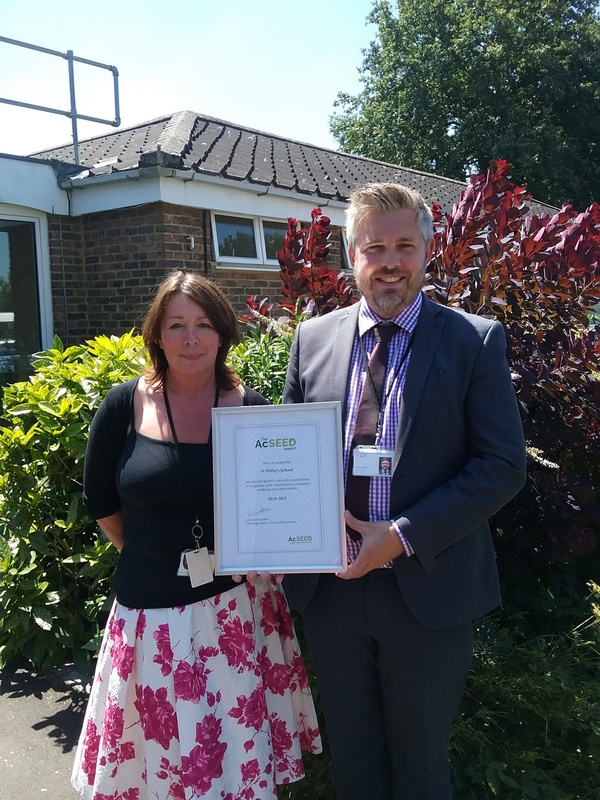 Horndean Technology College in Hampshire has become the first organisation to be accredited with The AcSEED Award. Head Teacher Mrs Summerfield received the award from AcSEED founder Charlotte at a ceremony held to mark the occasion on Friday 13th March 2015. 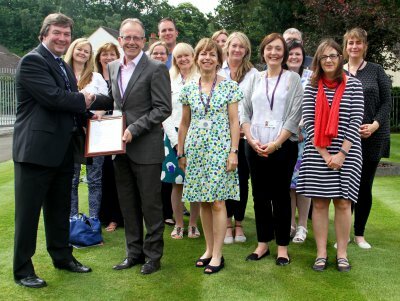 Picture: Staff and students of Horndean Technology College celebrate their AcSEED accreditation. Front row (left to right): Meon Valley MP George Hollingbery, Head Teacher Mrs Summerfield, Chair of Governors Robert Bedford, and AcSEED founder Charlotte Gatherer. 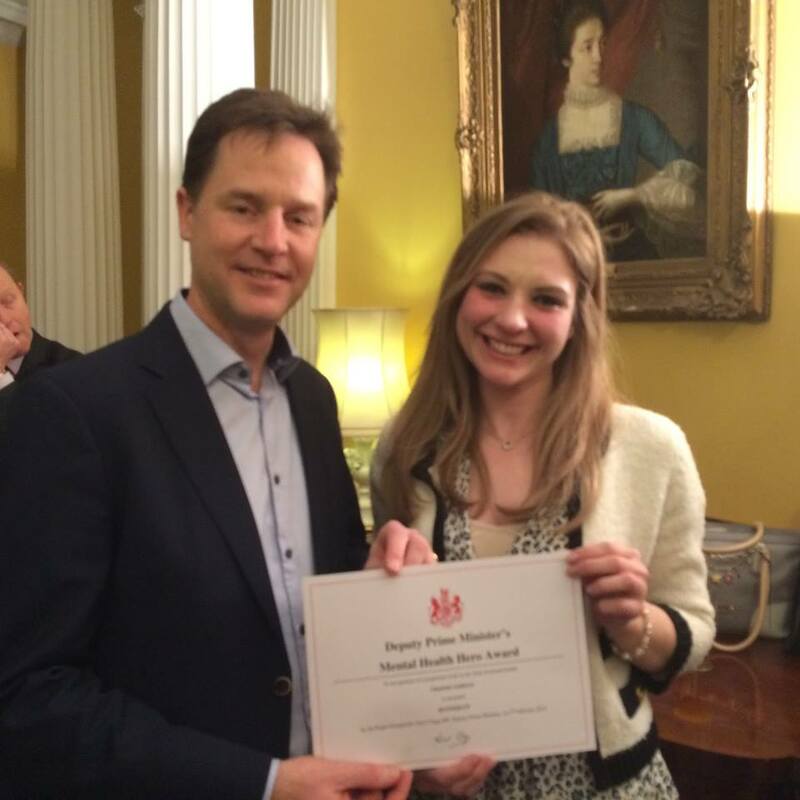 Picture: AcSEED founder Charlotte (right) receives her award from Deputy Prime Minister Nick Clegg. The AcSEED Initiative, in partnership with YoungMinds, supports the mental health and wellbeing of young people in schools, and will be supporting the YoungMinds VS program. AcSEED founder Charlotte was invited to attend the official launch of YoungMinds VS at The House of Commons on Monday 20th January 2014. The launch included pledges of support from Frankie Sandford of girl band The Saturdays and leader of the opposition Ed Miliband. 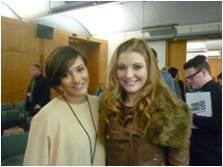 Picture: AcSEED founder Charlotte (right) with Frankie Sandford of girl band The Saturdays. The AcSEED Initiative is working with O2 Think Big to run a targeted event for school teachers to help increase awareness and understand the importance of Emotional Wellbeing. The half day event will include speakers from Heath and Education plus a young person with direct personal experience of mental illness. Progress can be tracked on our O2 Think Big Project Page. AcSEED are delighted to be working with Samaritans to develop their school education resources. The materials will be reviewed by volunteers from The AcSEED Initiative with the aim of making the already thorough resources even more engaging. With the support of Fixers, The AcSEED Initiative has released a short film promoting the importance of supporting the emotional wellbeing of students. Shot in the style of a news reel, the film focuses on the facts of mental illness with an interesting twist to conclude. The film is targeted at school staff and will be premiered in front of Hampshire teachers later this year. The AcSEED Website goes Live! The AcSEED Website will provide a focal point for news and information related to The AcSEED Initiative and The AcSEED Award. At launch the website aso includes blogs, video blogs, and a range of shared experiences which will continue to grow over time. Contributions to the website are always welcome (see the Contact Us page), and we hope this growing resource will help to educate and motivate many people on supporting emotional wellbeing in schools.